Allt-y-Brain in welsh means hillside of the Ravens or “Crows Wood”. Today the hills behind Alltybrain Farm are managed by the Forestry Commission and they lead to common land that forms a high ridge all the way from Brecon to Builth Wells giving intrepid walking and riding visitors spectacular views of The Brecon Beacons to the south, the Black Mountains to the east and the Eppynt hills to the north. Surrounding Alltybrain Farmhouse the hills were covered with indigenous woods right up until the early 1900s when the land was tilled and turned to pasture. Today the hills are farmed with beef cattle, sheep and welsh ponies. Alltybrain Farm was a working farm up until 1992. Nowadays we have a smallholding with pedigree Black Welsh mountain sheep, an assortment of ducks, Brecon Buff geese, various bantam hens, guinea fowl and miniature Shetland horses! We have two attractive high end four star graded Holiday Cottages each providing spacious accommodation for two people. We have The Hayloft available for nightly bookings for up to 4 self-catering guests who enjoy walking, cycling, fishing and bringing their own horses to stay here to explore The Brecon Beacons on horse back. We offer four star Farmhouse B&B accommodation in The Farmhouse. 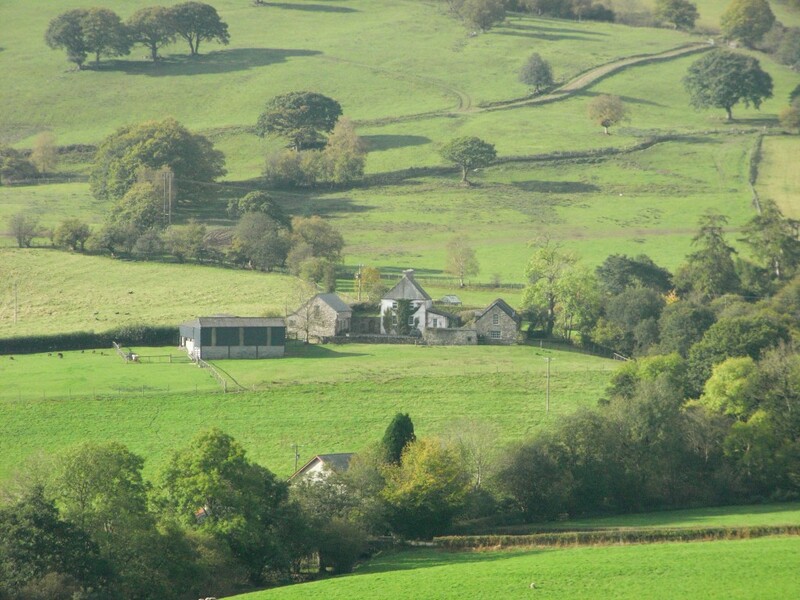 Alltybrain Farm Cottages and Farmhouse B&B is a place to stay for a quiet and peaceful holiday in the welsh countryside. Parts of the stone holiday cottages and farmhouse are over 300 years old and the original character of the barns and farmhouse have been sympathetically retained with ancient flagged stone floors and great thick walls which are still very much in evidence. The Farmhouse and holiday cottages are centrally heated and also have wood burning stoves to make sure that a very warm welcome and comfortable stay is offered to self-catering guests in the cottages and B&B guests staying in the Farmhouse. We hope that you will enjoy looking at our web-site and that you will find suitable accommodation with us for your holiday near the Brecon Beacons. Two night short breaks during autumn with a log fire and lovely views of the hills. Logs cut up for winter firewood. All logs are stacked in the pig cots for the cottages to have over the winter period. Nearly done! Old apple tree logs smell wonderful on the woodburning stoves!